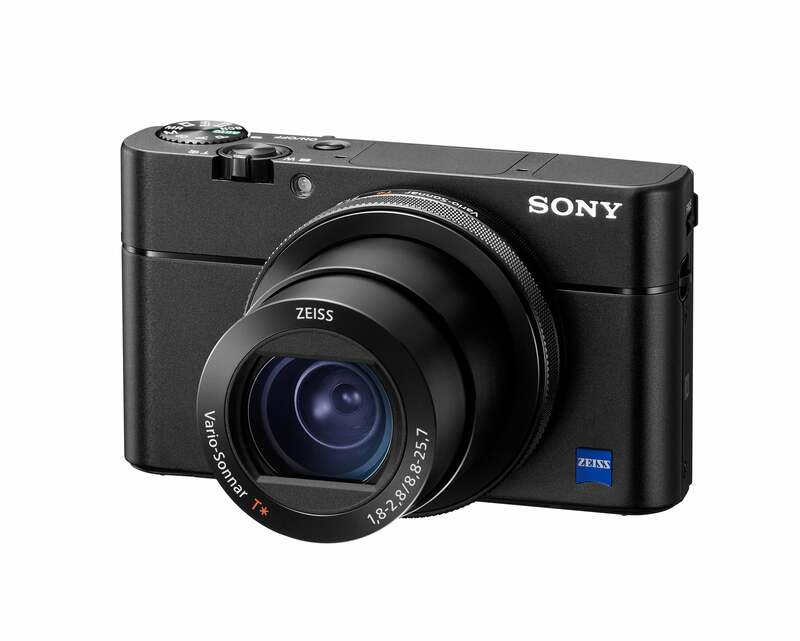 NEW YORK, Oct. 6, 2016 - Sony - a worldwide leader in digital imaging and the world’s largest image sensor manufacturer - has today announced a new flagship model for their popular Cyber-shot RX100 series of compact cameras, the RX100 V (model DSC-RX100M5). The exciting new camera brings a new level of AF performance and speed to today’s compact camera market. It is equipped with a Fast Hybrid AF system with the world’s fastest AF acquisition at 0.05 seconds and world’s highest number of AF points on sensor 1 with 315 points covering approximately 65% of the frame. The camera can also shoot continuously at speeds of up to 24 fps - the world’s fastest for a compact camera - at full 20.1 MP (approx. effective) resolution with AF/AE tracking for up to 150 continuous shots. 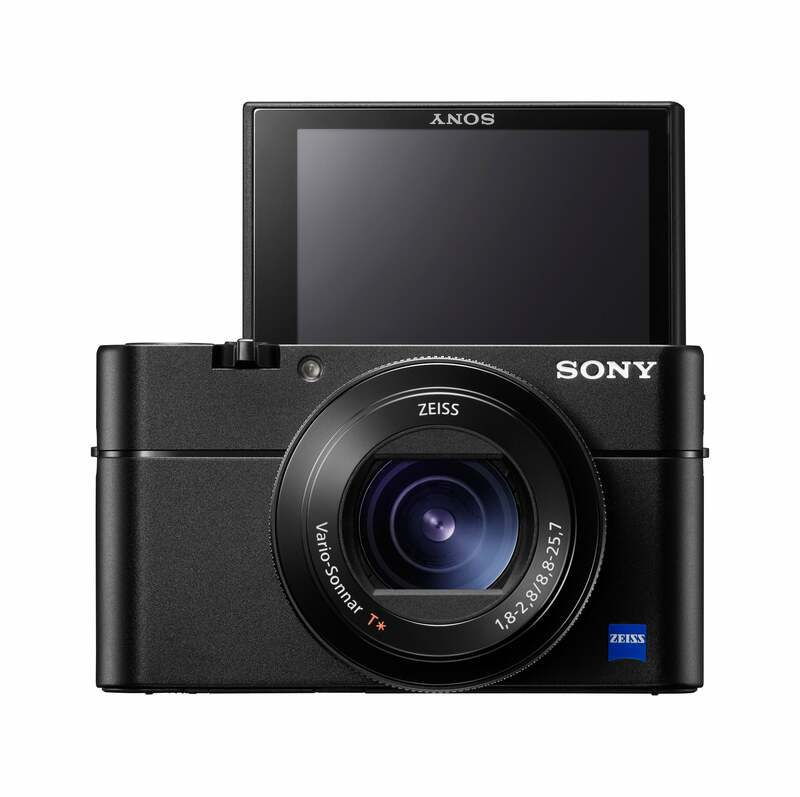 The RX100 V is equipped with a newly developed 1.0-type stacked Exmor RS™ CMOS sensor with a DRAM chip, a ZEISS® Vario-Sonnar T* 24-70 mm F1.8–2.8 large aperture lens and an enhanced image processing system with a new front-end LSI chip that maximizes processing speed, expands the memory buffer and optimizes image quality, in particular at high ISO settings. The camera also features 4K video recording with full pixel readout and no pixel binning, super slow motion recording at up to 960 fps with extended recording time and more. A first for Sony’s RX100 series of cameras, the new RX100 V model features a Fast Hybrid AF system that combines the respective advantages of focal-plane phase detection AF and contrast detection AF and ultimately enables the camera to lock focus in as little as 0.05 seconds. This high speed focusing is a perfect complement to the 315 dedicated AF points that cover 65% of the sensor, and ensures that shooters will be able to capture their intended subject with high speed and accuracy, even if it’s moving rapidly in unpredictable directions. Additionally, processing speed has been greatly enhanced through the addition of a front-end LSI that perfectly supports the camera’s BIONZ X® image processing engine. These two components combined with the powerful AF system allow the camera to shoot continuously at speeds of up to 24 fps at full 20.1 MP (approx. effective) resolution for up to 150 shots with AF/AE tracking. Viewfinder blackout between shots has also been minimized in this high-speed shooting mode, which greatly improves photographers’ ability to follow fast action and capture the decisive moment. Silent shooting is also available in these high-speed modes as well. Other advancements to AF performance on the new RX100 V include addition of AF-A mode, which allows the camera to automatically switch between continuous and single-shot AF modes. Users can also manually select if they’d like the continuous AF and phase detection AF areas to be displayed live on screen while they are framing a shot. 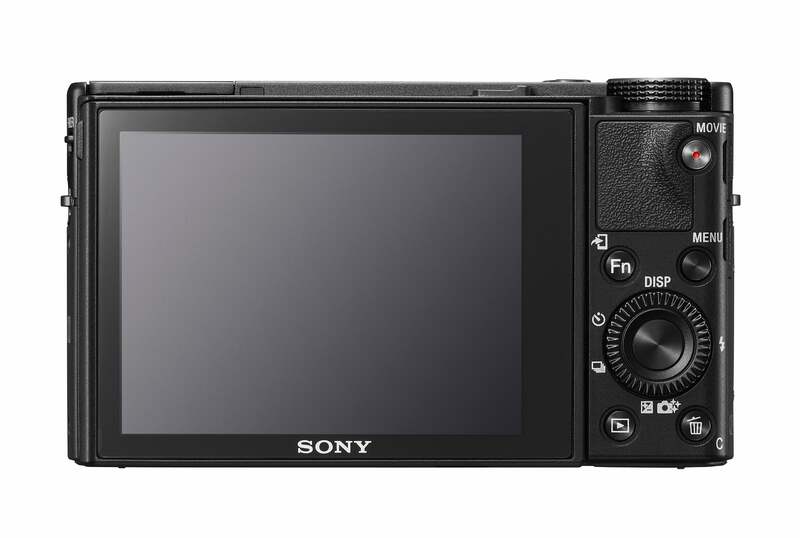 The RX100 V also has a high speed Anti-Distortion Shutter (maximum speed of 1/32000 second) that minimizes the “rolling shutter” effect commonly experienced with fast moving subjects. This fast shutter speed also allows the camera to capture sharp, crystal clear images with a wide open aperture at brightness levels up to EV19. Shooting at wide aperture with the fast shutter speed allows photographers and videographers to capture beautiful content with sharply focused subjects and defocused backgrounds under some of the most difficult, bright lighting conditions. New on the RX100 V, users can freely select the initial magnificent ratio when shooting in a mode with Focus Magnifier, and can select between “focus point” and “center of display” for the location of Focus Magnifier. With Fast Hybrid AF, the focal plan phase detection AF sensor ensures accurate focusing and tracking performance, even for the sever focusing requirements of 4K movie shooting. AF drive speed and AF tracking sensitivity can also be adjusted via the menu system, giving shooters plenty of flexibility based on their focusing preferences. In 4K mode, the new RX100 V utilizes full pixel readout without pixel binning to ensure that all the finer details of 4K video are captured with minimal moire and ‘jaggies’. These high-quality results are achieved through use of the XAVC S codec, which records video at a high date rate of up to 100 Mbps during 4K recording and 50 Mbps during full HD shooting. The RX100 V is able to record super-slow motion video at up to 40x slower than the standard rate, and can do this for about twice as long as the RX100 IV model. This extended time allowing users to capture a series of high-speed, fleeting moments of action with incredible detail, resolution and clarity. Prior to shooting, users will have the ability to choose among 960 fps, 480 fps and 240 fps frame rates and among 60p, 30p and 24p playback formats to optimize the recording to fit the speed of the moving subject, with the option to use the movie record button as a ‘start trigger’ to begin recording once button is pressed or ‘end trigger’ to record footage up until the button is pressed. The new RX100 V maintains the convenient pocket-sizes design of the remainder of the RX100 family and is equipped with a high-contrast 2.35 million dot XGA OLED Tru-Finder™, ensuring true-to-life image preview and playback functionality. The EVF conveniently retracts in and out of the camera body based on user preference, and features optics with ZEISS® T* Coating. The new camera is also Wi-Fi® and NFC™ compatible and can access Sony’s growing range of PlayMemories Camera Applications. Learn more at www.sony.net/pmca (https://www.playmemoriescameraapps.com). There will also be a new underwater housing (model MPK-URX100A) that will be available as a separate accessory for the RX100 V and all other RX100 series camera. Designed exclusively to fit the RX100 cameras, the housing feautres a depth level of 40m/120ft. A variety of exclusive stories and exciting new content shot with the new RX100 V camera and other Sony products can be found at www.alphauniverse.com (https://alphauniverse.com), Sony’s community site built to educate, inspire and showcase all fans and customers of the Sony α brand. The new content will also be posted directly at the global Sony Photo Gallery the Sony Camera Channel on YouTube. its product homepage on Sony.com HERE. For more information on the new underwater housing (model MPK-URX100A) for RX100 series cameras, please visit its product homepage HERE.